Help build the next era of sharing online. Make a donation to Creative Commons. 12 years ago today, we launched the first Creative Commons license suite. The internet was changing the way people share, and changing what it meant to be a creator. But copyright law hadn’t caught up. The Net was making sharing easy; the law was making it hard. We made a bet that many creators would stand between the extremes. That they would be inspired by the idea of “some rights reserved” and dedicate some of their rights to the commons. One billion licensed works later, I think we were right. Back then, it was a leap of faith. We just didn’t know. I certainly didn’t know that CC licenses would catalyze a global community in almost 80 countries, or that governments and foundations would take our values and embed them in official policies, dedicating funds to create freely available works. But that’s what CC has been helping to facilitate. Today, Creative Commons is making another leap. We’re betting that if we can make it more seamless to share CC-licensed content between different web platforms, we can multiply CC’s impact exponentially. So this is what our tech team is building. We’re also betting that by investing in a new generation of advocates for open, we can accelerate our policy wins to a worldwide tipping point. CC licenses are having a real impact on people’s lives. They are helping reveal information used to treat diseases, to make governments more transparent and accountable, and to make education accessible for everyone, everywhere. That’s an incredible impact for a set of simple, free licenses. That’s why I hope you will consider making a donation today. I’ve been inspired by many idealists. And I’ve had my heart broken more than a few times as I’ve rallied people together for change. But CC has proved that big change can happen, when it is supported by many, and often. So please take a moment to think about the role that Creative Commons licenses play in your life and in our communities. CC licenses have transformed how the internet works, but we’re just getting started. Please consider making a gift to Creative Commons. Stay up-to-date with CC by subscribing to our newsletter and following us on Twitter. We’re proud to present Series Two of Team Open, our ongoing project to tell the stories of people who use Creative Commons. In Series Two, you’ll meet a musician who used Creative Commons licensing to score a sponsorship deal with Toyota, a filmmaker who convinced his funders to give his film away, a professor who saved students a million dollars, and one of the minds behind the best-selling game on Amazon. When you use a CC-licensed photo in a presentation or share your latest song under CC, you’re a part of the story of CC’s impact in the world. We’re proud to share in this amazing journey with you. We’ve learned disturbing details of of the Trans-Pacific Partnership, an agreement that could extend copyright terms 20 years. Join us in demanding that the agreement be made public. Nearly 900 million CC-licensed works, and most of them under licenses that allow commercial use and adaptations. Check out our brand new State of the Commons report. Your daily awesome from the internet. Start your morning with the Creative Commons Thing of the Day. Remember that time when CC Version 4.0 broke the internet? Yesterday, CC Syria lead Bassel Khartabil spent his 1000th day in prison. We stand with our peers in the free software and free culture communities in demanding that he be freed. The Parable of the Polygons is a fascinating interactive essay on gentrification. It’s also in the public domain under CC0. If you’re in San Francisco, join us this weekend for a Wikipedia Editathon on internet censorship. A recent court case in Germany has raised some serious questions about the attribution requirement in CC licenses. Fortunately, we believe that common sense has won out in the recent appellate ruling. Amazing news. The Bill and Melinda Gates Foundation now requires open licensing for all grant-funded research. A few weeks ago, we published a report showing that there are nearly a billion Creative Commons–licensed works. That’s an impressive number, but it only hints at how powerful and widespread CC licenses have become. The real story of Creative Commons is the story of the people who use CC licenses. It’s the story of people who use CC licenses to make information, education, and data more public and accessible. Creators who have built real careers on free and open content. Policymakers working to make open the rule, not the exception. If you’re reading this, the story of CC is your story. Today, we’re proud to present Series Two of Team Open, our ongoing project to tell the stories of people who use Creative Commons. In Series Two, you’ll meet a musician who used Creative Commons licensing to score a sponsorship deal with Toyota, a filmmaker who convinced his funders to give his film away, a professor who saved students a million dollars, and one of the minds behind the best-selling game on Amazon. If you’re proud to be on Team Open, please consider making a donation to help carry Creative Commons into 2015. Today Creative Commons and 47 civil society organizations and academics released a letter (PDF) calling on negotiators of the Trans-Pacific Partnership (TPP) to publish the draft text of the agreement. Up until now the text of the TPP has been developed mostly in secret by the 12 negotiating countries. Wikileaks published a draft text of the chapter on intellectual property in October, revealing several provisions that would threaten access to and re-use of creative works, including an arrangement to allow countries to extend copyright terms by another 20 years. CC and other groups wrote a letter calling for that proposal to be rescinded. Today’s call for increased accountability into the process and substance of the TPP agreement follows on the heels of the European Commission’s announcement for transparency into the negotiations over the Transatlantic Trade and Investment Partnership (TTIP), a trade agreement being negotiated between the United States and the European Union. The text of the letter (PDF) is below. Ever since talks over the Trans-Pacific Partnership agreement (TPP) began over five years ago, there have been broad public calls on leaders to make negotiations more transparent and open to the public. In statements, in letters, and in face-to-face meetings with trade representatives, we have urged the adoption of concrete practices that would better enable the kind of open debate and oversight that would help demystify these ongoing negotiations by making better, more accurate information available to the public. The European Commission has recently taken leadership on this issue in the parallel context of negotiations over a Trans-Atlantic Trade and Investment Partnership (TTIP), recommending on 25 November 2014 that the EU’s TTIP text proposals henceforth be released to the public, and that other information related to TTIP be shared more broadly with all Members of the European Parliament, beyond the currently limited membership of the International Trade Committee. The end of TPP negotiations now seems to be coming into focus. They have come down to high-level political decisions by negotiating countries, and the text is largely completed except for some resolutions on remaining landing zones. At this point, we know that there is a draft of the TPP that is mostly agreed upon by those negotiating the deal. Today, we strongly urge you to release the unbracketed text and to release the negotiating positions for text that is bracketed, now and going forwards as any future proposals are made. The public has a legitimate interest in knowing what has already been decided on its behalf, and what is now at stake with our various countries’ positions on these controversial regulatory issues. We call on you to consider the recent announcement from the European Commission as a welcome precedent to follow, thereby re-affirming your commitment to fundamental principles of transparency and public participation in rule making. The negotiations in Washington DC this week would provide the perfect opportunity for such a ground-breaking accord to be announced. Anyone conducting advocacy and outreach work for Open Educational Resources naturally hears a lot of criticism of openness. While some of it is valid, much is based on lack of knowledge, unfounded fears and misconceptions or even misrepresentations of the issue. After hearing them one time too many, we decided to create an „OER mythbusting guide”, which collects the most popular myths, together with ways of „busting” them. We are launching the Open Educational Resources mythbusting guide today, both as an online resource and a PDF guide (which can also be printed). The site is divided into two parts – a mythbusting guide and a quick introduction to OER. Both will help you find fast, simple and useful answers to myths, statements and unsupported claims about how Open Educational Resources (OER). The guide has been written by Kamil Śliwowski (CC Poland) and Karolina Grodecka (Coalition for Open Education, Poland) and is based on results of a series of mythbusting workshops conducted over the course of the last year and a half, as well as a survey among OER advocates. As of today, Creative Commons Syria lead Bassel Khartabil has been in prison for 1000 days. Today, we take a moment to honor Bassel and his contributions to Creative Commons. And we stand with our peers in the free software and free culture communities in demanding that he be freed. Bassel’s imprisonment is also a reminder that our fight is real. For those of us that work in relative safety, it can sometimes be easy to forget that a free and open internet is not a theoretical matter. Real lives are at risk. Visit freebassel.org for more information on Bassel and how you can get involved. If you’re in San Francisco, visit Noisebridge this evening for a Free Bassel letter-writing event. CC co-founder Lawrence Lessig will speak on January 9 at the Jewish Community Center of San Francisco. JCCSF has provided CC with a special discount code to share with our community. Harvard Law Professor and legal activist Lawrence Lessig (Republic, Lost) believes he’s found a way to mitigate the corrosive effect of big money on elections. He discusses Mayday PAC, his own crowd-funded Super PAC, launched in order to elect a Congress committed to fundamentally reforming the way campaigns are financed. If you use the code DEMOCRACY, you can pay $10 for standard or $15 for premium tickets. Join us in San Francisco on December 14 for a Wikipedia Editathon on interent censorship. If you’ve never edited a Wikipedia article, don’t worry! There will be experts there to help you through the process. Join volunteers from the Electronic Frontier Foundation, Creative Commons, and the Bay Area Wikipedia community to write and edit about human rights and free speech online. We will improve, create, and update Wikipedia articles related to global internet censorship. People regularly turn to Wikipedia to get a basic overview of internet censorship, so it’s crucial that we ensure Wikipedia’s coverage is up-to-date and accurate. Internet censorship means that users across the world aren’t always using the same Internet, cannot access the same websites, or can’t contribute to or read the same Wikipedia articles. Speech-chilling government surveillance, blocking, and filtering are all methods of censorship, and they are globally ubiquitous. Internet censorship impacts users everywhere, because fewer people are able to upload or contribute to the Internet or access information online. In addition to improving articles on Internet Censorship as a broad topic, we will focus on improving and updating key articles about internet censorship for individual countries, and if possible, ensure the content is also available in their local language. Please join us in person or online to help improve the public conversation on Internet Censorship. All levels of Wikipedia-editing experience are welcome! December marks the time of year when many of us start thinking about making year-end gifts to our favorite charities, and #GivingTuesday has become one of the most popular days for donating. As you’re thinking about which organizations you’ll support this year, we hope you’ll think about how Creative Commons affects your life (and the lives of millions around the world). Our core values are rooted in helping people to share their ideas, art, research, and culture with the rest of the world. That sharing can really add up too. Our recent State of the Commons report (translated by volunteers into 12 languages and counting) found that textbooks shared with open licenses have saved students more than $100 million. CC is a small organization, but we still need resources to educate policy makers, support online sharing platforms, promote the benefits of open licenses, and grow our community. So, if you are in a giving mood on #GivingTuesday, consider a gift that supports #SharingEveryday! A recent court case in Germany has raised questions among some CC license users about what qualifies as reasonable attribution. Must websites that use openly licensed images make the attribution information visible at all times, even in a gallery of image thumbnails? And what about when a visitor accesses an image directly, via the “View Image” feature in her web browser? Must attribution information be visible then too? Fortunately, we believe that common sense has won out in a recent appellate ruling. The defendant had diligently attributed the rightsholder on the page where they used the picture, but the website also had a dynamically generated “overview” gallery showing preview thumbnails of pictures and the site didn’t restrict users from downloading the images via “View Image.” When a visitor viewed an image in these two ways, attribution information was not visible. The trial court ruled that the preview thumbnails (which did not include attribution information) were acceptable as they were under the two rulings of the German Federal Supreme Court on preview pictures. Regarding the direct viewing via “View Image”, the court ruled that this was not covered by the thumbnail rulings, and interpreted the terms of service of the stock photo site to require attribution no matter how the picture is viewed. The judges said that the name of the rightsholder would in case of “View Image” need to either be integrated into the picture itself (i.e. as an additional part of the graphic) or be part of the URL of the picture. The stock photo provider, which was not a party to the case, provided a statement on behalf of the defendant, saying that their terms of service were not intended to require that the name of the author (also) be part of the URL. Nonetheless, the court ruled otherwise. The main argument advanced was that “appropriate to the medium” only applied to how attribution was to be given, not to whether it would be given, and as the picture could be viewed separately, attribution was also required in that view no matter how complicated its implementation would be. After the decision became public, a debate started amongst bloggers and others who regularly use CC-licensed pictures, many of whom worried whether the court’s strict interpretation of the attribution requirement would also be relevant to how the BY condition of CC licenses is interpreted, at least under German copyright law. It was obvious that almost none of the CC-licensed pictures used on the net are attributed in the graphic itself or in the URL, and that it would be virtually impossible to move attribution to such a standard across the net. On appeal, the higher district court in Cologne indicated in an oral hearing in August that they did not intend to follow the original decision. Firstly, in their view, the terms of service are very strictly against editing/adaptations of the pictures taken from the site, which speaks against the obligation (or even the right of users) to insert attribution information into the graphics. This would constitute an impermissible edit. Secondly, they interpret “appropriate to the medium” to not only cover how attribution is given, but also to cover whether/when attribution is necessary. The court regards the “View Image” function as a mere technological side-feature of how the web works and not a separate type of use that requires separate approval by the rightsholder. The latter in effect means that this function doesn’t trigger separate obligations on the user’s part, beyond the ones triggered by the use of the picture in the regular browser view. The plaintiffs subsequently took back their claims. Users of pictures that are available under standard terms can relax again to some extent regarding the practicalities of attribution. While it’s limited to Germany in its legal applicability, this ruling demonstrates how flexible attribution requirements can be well understood by all parties and adapt well to changing technology. The ways that we share content on the web are changing all the time, but if you approach CC licenses with a reasonable, logical approach to attribution, misunderstandings will be few and far between. Creative Commons staff, affiliates, and supporters were active participants and contributors at this year’s Mozilla Festival, which has become an annual rallying point for the Open Web and our shared values. Our sessions covered a wide range of issues, from new technology, to open education and science, to working as an open organization. Thanks to Mozilla for inviting us. We’re already looking forward to next year’s event. In CC makes tools for makers, CC’s Ryan Merkley and Matt Lee joined Mozilla dev Ali Al Dallal to talk about tools and technology solutions that could enhance the reach and value of CC-licensed works. CC shared some early screens for The List, a new mobile app that allows anyone to create and share a list of wanted images, and allows users to respond by taking pictures and sharing them in a global archive, all licensed CC BY. CC also shared CC Search, which will aggregate results from publicly-facing search APIs of openly licensed works. Ali demoed a prototype of MakeDrive, which will allow a user to search for a CC image, then grab it into their own local synced storage. Participants broke into smaller groups to discuss challenges and opportunities, and identified solutions that were shared back with the group. Issues ranged from UX and usability needs to opportunities for monetization. Everyone was encouraged to join The List mailing list at creativecommons.org/thelist for updates, and to head to hackspace.cc to join the development process and contribute. In Portrait of a Creative Commons Artist, a group of musicians, filmmakers, museum curators, and arts education practitioners gathered to discuss the kinds of art being created in today’s digital landscape and how and why they share their artworks and the artworks of others. Surprisingly, or unsurprisingly, the artists’ motivations for sharing included no commercial goals. Motivations cited included wider distribution; to grow a community of like-minded artists; to elicit feedback or emotion; and result in new inferences and ways of thinking. We also identified barriers to sharing in certain environments, such as child privacy in arts education and the time-consuming effort involved in cataloging artworks for museums. We addressed individual artists’ hang-ups to sharing, such as fear of plagiarism and not being quite ready or confident in the quality of one’s art to open it up for public criticism. Lastly, we brainstormed potential solutions to overcoming these barriers and help artists feel more comfortable with sharing their works online under more liberal re-use terms, such as Creative Commons licenses. Such solutions included: a tool that could display a canonical representation of your work, including all derivatives made from the original; a better attribution prompt enabling artists to specify exactly how they want to be attributed; and a registry of artworks in the commons. Additional needs included improved interaction design with artworks online, consulting or advisement on how to share such networked art, and simplified best practices around sharing and attributing open artworks. Full agenda and notes from the session are available, in addition to Kevin’s coverage of the session in The Open Standard, “The Plight of the Open-Source Artist” — which is aptly licensed under CC BY-SA. This session affirmed and informed our intentions with several CC projects in development, such as a registry of CC-licensed works, a smart phone application that would make it easier for photo contributions to the commons (The List), and the Free Culture Trust, a coalition of organizations that would offer comprehensive services to artists wanting to donate their art to the commons. In Mapping #SchoolofOpen and #TeachtheWeb to places, community members from Creative Commons, School of Open, and Mozilla Webmaker came together to physically map their open web education programs, such as Maker Party and the recent School of Open Africa launch. We “hacked” a map of the world by creating our own version of it, and most interestingly, Africa was front and center with the U.S. largely as an afterthought. After mapping, we self-organized into two streams: those leading open web education for adults and those leading open web education for kids and teens. After much discussion, we are now planning to better bridge our communities to increase our impact in several regions, including Africa, India, and the U.S. We will be creating a digital version of our Hack the Map activity, allowing others to add themselves virtually over time, and also planning a joint School of Open and Mozilla Webmaker event with our communities for 2015. In OpenMe – Kids can Open, a few of us from the CC, School of Open and National Writing Project communities gathered to discuss current efforts around CC and open web education for kids and strategies for replicating those efforts in other jurisdictions. Kelsey Wiens, CC South Africa public lead and School of Open program lead for CC4Kids, shared her experience with piloting CC4Kids in schools. Generally, starting with private schools resulted in more favorable results, in addition to partnering with existing organizations with strong ties to schools, such as Innovate South Africa’s Code4ct. We are now in conversation to pilot the CC4Kids model in the U.S. with the National Writing Project’s Educator/Innovator network. To start, we will be hosting a webinar as well as sharing a call to the network for after school pilot participants. Complete notes from the session are available, in addition to results from the Community Building track of which this session was a part. The wranglers for the track are now working on a community building toolkit and will be rallying all organizational representatives in the next few months to make one of the above ideas into a reality. We vote for the Annual Capacity Building Conference of open orgs! In the Skills and Curriculum Mapping for Open Science session, facilitators and participants on Mozilla Science Lab’s “Science on the Web” track came together to build a map linking together the many nouns and verbs that describe interactions between people and scientific research, all of which are connected the Commons. An underlying focus of the session was to identify the ways scientists and citizens interact with outputs of research including content, data and code. Taking a simplified approach to mapping these nodes will lend to the ability of others to expand on the map, and to translate the nodes into learning objectives that can be included in education and training programs around open and reproducible science. Over the two days of the festival, we facilitated the mapping of outputs and interaction types, aiming to capture key statements that describe the way scientific artifacts are created, reused/remixed, and shared. We welcomed scientists and non-scientists alike to stop by and critique the map as it was constructed, and to add nodes or connections where they felt something was missing. Did you ever once produce a dataset for your research blog? Then you’ve created data! Have you ever downloaded an Open Access research paper? If you have, then you’ve reused content! Have you ever uploaded a script to Github? Then you’ve shared code! It’s easy to drop most interactions people have with science into these buckets once we take a step back, and simplify the statements around what we do with scientific content and code in the Commons. To allow others to build on the skills mapping done at Mozfest this year, a digital version of the map has been uploaded to Github , and is open for anyone to revise, tweak, and add to as they wish. Plans to expand this work include a full build out of high-level learning objectives, and alignment to existing Open Educational Resources in science training programs. A number of universities have expressed interest in piloting an undergraduate or graduate-level course on open and reproducible science, and the idea is that this map will be useful when developing such a course, revealing how and where skills learned in such a course apply to the way we work with content and code in the Commons. The newly founded K-12 OER Collaborative has released an RFP for the creation of open educational resources (OER) in mathematics and English language arts and literacy. As all content developed under this RFP will be openly licensed under CC BY 4.0, U.S. states, territories and school districts (and anyone else in the world) may freely reuse, revise, remix, redistribute and retain these educational resources. Forty-three US States + Washington DC + Guam + American Samoan Islands + US Virgin Islands + Northern Mariana Islands (map) have adopted the Common Core State Standards (CCSS)… and they all need current, high quality, affordable, CCSS-aligned educational resources for their students, teachers, parents and districts. Will these US States and territories have the public funds necessary to update educational resources (including textbooks) for these two subjects? According to the Association of American Publishers school districts across the U.S. spend over $8 billion on instructional materials every year. Textbooks quickly fall into disrepair, students are not allowed to write in or keep their books as they graduate each grade, and teachers are not legally and technically empowered to update outdated educational resources. In addition, much of this spending is on costly, yearly subscription fees for digital content which school districts merely lease (not own). This aggregate demand represented by the nationwide need for new CCSS-aligned educational materials creates a unique opportunity for states to acquire higher quality, more effective content in a smarter, far less expensive, and far more flexible manner, and make these resources available to teachers, parents and districts. Specifically, states and districts can transition from expensive and rigidly controlled materials to OER. Courses will be designed to meet Common Core State Standards, accessibility standards, technical specifications, and an open licensing requirement of CC BY 4.0 on all new content produced. For details on the development process, see the complete RFP. An informational webinar will take place next week on December 3, 2014 at 10:00 AM PST for those interested. RSVP at http://k12oercollaborative.org/rfp/webinar/. The deadline for an initial Letter of Intent is January 9, 2015 by 5:00 PM PST. The K-12 OER Collaborative is a coalition of eleven U.S. states and eight organizations, including Creative Commons. Together we are working to make quality K-12 educational resources aligned to state standards and accessible under the most open Creative Commons license, CC BY, so that we can drive down the cost of K-12 education for everyone. Learn more about the collaborative at http://k12oercollaborative.org. November 25, 2013, was a day we had looked forward to for years — the official launch date of Version 4.0 of the Creative Commons licenses. But despite months of planning, something unexpected started to happen just after we hit publish: our website started to fail. We spent the next 12 hours working to fix the current setup while simultaneously moving our website to higher-performance servers. That situation was maddening: for a few hours, half of the world could see the new 4.0 licenses, and half couldn’t. Finding a fix was our highest priority. All hands were on deck to ensure we delivered on our promise of providing stable, trustworthy infrastructure for our licenses. And deliver we did. By the morning of the 26th, the entire world awoke to a new set of CC licenses — licenses that reflect two years of work by some of the best minds in copyright law on the planet. I’m telling you about the site outage for two reasons. First, it shows us for what we are: a very small organization with extremely limited resources. CC licenses will always be free, but maintaining them isn’t. Whether it’s tech infrastructure, adoption support, or helping users understand the licenses, our stewardship responsibilities are ongoing, in demand, and require resources. Second, and more importantly, it says a lot about you. A lot of you were up all night with us. The people who could see the new licenses were excitedly sharing details with those of you who couldn’t, and asking us how they could help. I remember laughing to myself, “How many site outages get live-blogged?” Basically, you’re the best community we could ask for. If you can, please consider making a gift to help carry Creative Commons into 2015. Together, we built state-of-the-art licenses that we’ll all be using for the next decade. But there’s a lot more work to do, for all of us. Thank you for sharing with us in this dream of a world where knowledge and culture are more accessible to everyone. We’ll never stop fighting for that world, even if it means pulling a few all-nighters. Philanthropic foundations fund the creation of scholarly research, education and training materials, and rich data with the public good in mind. Creative Commons has long advocated for foundations to add open license requirements to their grants. Releasing grant-funded content under permissive open licenses means that materials may be more easily shared and re-used by the public, and combined with other resources that are also published under open licenses. Yesterday the Bill & Melinda Gates Foundation announced it is adopting an open access policy for grant-funded research. The policy “enables the unrestricted access and reuse of all peer-reviewed published research funded, in whole or in part, by the foundation, including any underlying data sets.” Grant funded research and data must be published under the Creative Commons Attribution 4.0 license (CC BY). The policy applies to all foundation program areas and takes effect January 1, 2015. Publications Are Discoverable and Accessible Online. Publications will be deposited in a specified repository(s) with proper tagging of metadata. Publication Will Be On “Open Access” Terms. All publications shall be published under the Creative Commons Attribution 4.0 Generic License (CC BY 4.0) or an equivalent license. This will permit all users of the publication to copy and redistribute the material in any medium or format and transform and build upon the material, including for any purpose (including commercial) without further permission or fees being required. Foundation Will Pay Necessary Fees. The foundation would pay reasonable fees required by a publisher to effect publication on these terms. Publications Will Be Accessible and Open Immediately. All publications shall be available immediately upon their publication, without any embargo period. An embargo period is the period during which the publisher will require a subscription or the payment of a fee to gain access to the publication. We are, however, providing a transition period of up to two years from the effective date of the policy (or until January 1, 2017). During the transition period, the foundation will allow publications in journals that provide up to a 12-month embargo period. Data Underlying Published Research Results Will Be Accessible and Open Immediately. The foundation will require that data underlying the published research results be immediately accessible and open. This too is subject to the transition period and a 12-month embargo may be applied. Congratulations to the Bill & Melinda Gates Foundation on adopting a default open licensing policy for its grant-funded research. This terrific announcement follows a similar move by the William and Flora Hewlett Foundation, who recently extended their CC BY licensing policy from the Open Educational Resources grants to now apply foundation-wide for all project-based grant funds. Regarding deposit and sharing of data, the Gates Foundation might consider permitting grantees to utilize the CC0 Public Domain Dedication, which allows authors to dedicate data to the public domain by waiving all rights to the data worldwide under copyright law. CC0 is widely used to provide barrier-free re-use to data. We’ve updated the information we’ve been tracking on foundation intellectual property policies to reflect the new agreement from Gates, and continue to urge other philanthropic foundations to adopt open policies for grant-funded research and projects. Today, we’re releasing a new report that we think you will want to see. State of the Commons covers the impact and success of free and open content worldwide, and it contains the most revealing account we’ve ever published, including new data on what’s shared with a CC license. We found nearly 900 million Creative Commons-licensed works, dramatically up from our last report of 400 million in 2010. Creators are now choosing less restrictive CC licenses more than ever before — over half allow both commercial use and adaptations. We’re also celebrating the success of open policy worldwide. Fourteen countries have now adopted national open education policies, and open textbooks have saved students more than 100 million dollars. These are big moves making big impacts. Please help us spread the word about this groundbreaking report. If Creative Commons plays a role in how you use the internet or share your work, please consider making a gift to support the organization. Creative Commons licenses will always be free, but they would not exist without your generous support. Babson Survey Research Group has recently published the results of its survey study „Opening the Curriculum: Open Education Resources in U.S. Higher Education, 2014″. The study (funded by the William and Flora Hewlett Foundation and with support from Pearson) is unique in providing a statistically valid, quantitative view of the ways that American academic staff understands and uses OERs. The study drew the attention of the OER community by providing an objective measure of the awareness of OER. 5% of respondents declare they are „very aware”, 15% that they are „aware” and 14% that they are „somewhat aware”. Is that a lot, or too little? Commentators have focused on whether this is good, or bad news for OER (see David Wiley here or Phil Hill here, for example). In my opinion. that’s not the key issued raised by the study. The respondents were then asked to provide some examples, and to confirm their understanding of OER by choosing statements that they would use „to describe the concept of OER to a colleague”. Over 70% would choose availability for free, over 50% the ability to remix or ease of combining with other materials. Creative Commons licensing is mentioned most rarely (by 28% of respondents). The last item should be troubling for OER advocates, as free licensing is considered a necessary element of open education. I don’t think that this is the correct way of measuring OER awareness. Respondents report their understanding of OER definitions only after having been provided with the very definition – which must lead to a bias. This is a general problem with the survey (and even more generally with the survey method) – it assumes a level of clarity in understanding OER, which in real life is not present among the studied faculty. Taking aside a narrow group (5-20% of respondents) who are clearly aware of OERs (and who can be asked specific questions), for other respondents the survey at the same time measures and builds awareness. Can we speak about OER without mentioning „OER”? One of the stranger results of the study is that those who know and use OER chose specific statements about the OER definition as often as those who are not aware of such resources. Similarly, only 34% of respondents are aware of OER (including those 13% who are „somewhat aware, but not sure how to use them”), while 50% of faculty declare use of OERs. And finally, if open licensing is commonly described as a key element of the OER model, then why only 1/3 of those who use OER consider it important? All these mysteries have a simple possible solution: academics simply don’t know what they mean, when they answer questions about „OER”). (There’s a chance – small one, in my opinion – that people recognise OER by specific „brands” instead of the licensing model. It would have been interesting to ask about awareness of most popular OER projects, such as Openstax). This is ultimately not a problem with the survey itself, as care was clearly taken to create a proper survey methodology. It is a problem faced by all OER advocates – in most cases, we’re not only promoting an alternative intellectual property rights model for education; we have to make educators aware of the very issue of IPRs. It’s an issue that many educators don’t understand or don’t care about – they either ignore it, or expect that it will be solved by their institution (In Poland, we gathered research data on this – but I assume that the issue is more or less similar around the world). Without making them aware about OER, we cannot achieve change. So we have to make people care and worry about the very issue that we’d like to see becoming insignificant. Because without a „strict” understanding of OERs, we face open washing (to use David Wiley’s term), a dilution of the open model. Low declared awareness of Creative Commons licenses, and of their significance as part of an explanation of what OER is, shows just how difficult this task is. And the risk of openwashing will grow, the more OER become mainstreamed. I think that a study of OERs should not map awareness of the concept itself. Similarly, asking respondents to declare willingness to use OER in the future offers little predictive power with regard to their future actions. Instead, we should try to map and understand practices around the use of resources by educators – and then decide whether they fit a definition of what OER is. For example, educators could be asked to keep digital „resource use diaries”, which could then be analysed, with links checked for open content licensing. We also need to go beyond quantitative, survey methods – these are great for mapping well understood concepts. But when facing issues that are still being constructed in the society, qualitative studies are much more important. Surveys provide us with general driving directions instead of precise maps. Interviews and ethnographies could help to define the „real life understanding of open”, and see whether it overlaps with the formal definitions of open. Cost is among the least important criteria used by academics for choosing resources. 3% worry about cost, while 20% care about ease of use, 50% about quality and 60% about efficacy. Obviously, these costs are not covered by instructors, who rationally do not worry about them. But the data suggests that the typical OER argument – „it’s free” – will not be convincing for educators. Only 35% of educators are „very aware” about copyright (even fewer about Public Domain and Creative Commons). This is an extremely low value for a knowledge-intensive sector in a knowledge-based society. The survey asks about „licensing models” – but this is also, and more importantly, an issue of user rights. Asked about deterrents to OER adoption, 1/3 of respondents mention lack of knowledge about permissions to use – which is the most shocking number for a study on resources with an explicit permission to use. When asked about what types of resources they use, faculty members that declare OER use mentioned: images (89%), videos (88%), followed by video lectures and tutorials (60%). Ebooks and textbooks are relatively often used, but below the 50% mark. This suggests that some of the most often used OERs are incidental (images). It might also be a measure of a shift in American higher education away from traditional, printed resources. (It would be useful to collect similar data for non-open resources). Earlier this month, CODATA and World Data System, both interdisciplinary committees of the International Council for Science, jointly organized SciDataCon, an international conference on data sharing for global sustainability. The conference was held Nov 2-5, 2014, on the campus of Jawaharlal Nehru University, New Delhi, India. Creative Commons Science had a busy schedule at the conference attended by 170+ delegates from all over the world, many from the global south. We started early with a full day workshop on text and data mining (TDM) in cooperation with Content Mine. The workshop was attended by a mix of PhD students and researchers from the fields of immunology and plant genomics research. It was really rewarding to see the participants get a handle on the software and go through the exercises. Finally, the conversation about legal uncertainty around TDM appraised them about the challenges, but bottom-up support for TDM can be a strong ally in ensuring that this practice remains out of the reach of legal restrictions. During the main conference we joined panel discussions on data citation with Bonnie Carroll (Iia), Brian Hole (Ubiquity Press), Paul Uhlir (NAS) and Jan Brase (DataCite) and international data sharing with Chaitanya Baru (NSF), Rama Hampapuram (NASA) and Ross Wilkinson (ANDS). We also participated in a daily roundup of the state of data sharing as presented at the conference organized by Elizabeth Griffin (CNRC). SciDataCon, which used to be called CODATA, is held every two years, and is an important showcase of open science around the world. It is an important gathering for it brings together many scientists from the global south. A lot remains to be done to make real-time, pervasive data sharing and reuse a reality in much of the world, but there are heartening signs. At a national level, India’s data portal holds promise, but making data licensing information more explicit and data easily searchable by license would make it more useful. Citizen science projects in the Netherlands, India and Taiwan demonstrated how crowds can be involved in experiments while ensuring the user-generated content is made available for reuse, and SNEHA’s work on understanding perspectives on data sharing for public health research was particularly insightful of the value of listening to the feedback from participants. We look forward to continue working with CODATA and WDS promoting and supporting open science and data initiatives around the world, and particularly in the global south, and hope for more success stories in the next SciDataCon. We are thrilled to announce our first official translation of 4.0, into Finnish. 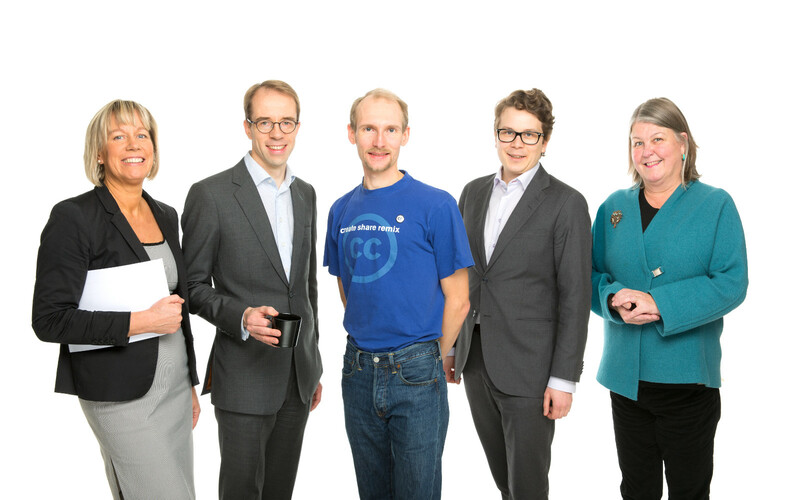 Congratulations to the CC Finland team, who have done an outstanding job. The translation team consisted of Maria Rehbinder of Aalto University, legal counsel and license translation coordinator of CC Finland; Martin von Willebrand, Attorney-at-Law and Partner, HH Partners, Attorneys-at-law Ltd: for translation supervision; Tarmo Toikkanen, Aalto University, general coordinator of CC Finland; Henri Tanskanen, Associate, HH Partners, Attorneys-at-law Ltd: main translator, and Liisa Laakso-Tammisto, translator. Particular thanks go to Aalto University, HH Partners, and the Finnish Ministry of Education and Culture for their support. Internationalization was one of the 5 main goals of the 4.0 licenses, so this is an important milestone for the CC community. Our translation policy was written to reinforce that goal: if the licenses work everywhere, everyone should be able to use them in their own language without needing to worry about what the original English version says. The official translations are accessible to anyone, anywhere wishing to have access to the official legal text of the 4.0 licenses in Finnish. Particular kudos go out to this team for their detailed work: producing linguistic translations is difficult! Many words don’t have exact equivalents between languages, especially where you’re bringing in specialized language from countries with different legal systems. Teams working on translations go through a detailed review of their work with CC to ensure that the meaning of the documents lines up. This often involves many detailed questions about exact meanings of words and the legal concepts they refer to, especially when no one on the CC legal team speaks the language. (If you’re particularly curious, you can look at some of the notes in the translators’ guide.) The Finnish team anticipated most of the questions we might have asked, providing a detailed explanation that will be useful as an example to others, and their thorough work has paid off. Keep your eyes out: several more translations are in the final stages of review and will be published in the coming months! In the meantime, we join CC Finland in celebrating the launch of the first official 4.0 translation. The Voyager Spacecrafts are carrying with them sounds of the earth, of our civilization, recorded on a 12″ gold plated copper disc, a golden record, along with instructions for how to play them. Lily Bui, a graduate student in the MIT Comparative Media Studies program built a lovely web site that allows everyone to enjoy the sounds and music from the golden record via an attractive, easy to use web interface. In a serial burst of inspiration, Lily has also dedicated her web site to the public domain via a CC0 Public Domain Dedication. In her words, “To be perfectly frank — I mostly designed this mostly for myself so that I wouldn’t have to access the archival audio through the Library of Congress portal.” Well, turns out a lot of people share Lily’s point-of-view. Ever the academic, she was taking a course at MIT that “examined the ‘migration of cultural materials’ into the digital space, combining traditional humanities with computational methods.” She is convinced her work is grounded in theory. Perhaps, for we love the sounds and music so much that we have yet to read Humanities Approaches to Graphical Display by Johanna Drucker. Join Lily and all of us at Creative Commons and give the Voyager Golden Record a listen. Creative Commons wasn’t done after we created our first license suite, or even after hundreds of millions of licensed works were shared. The web is changing — and so are the ways we get, share, and use content — so we’re trying new things. One new idea is our mobile app, The List, supported by a prototype grant from the Knight Foundation. The List app will allow users to make lists of wanted images, or submit requested photos to a global archive of images, all licensed CC BY. We’ll release a public beta in the next few months. We’re also still active in areas where we can make a huge difference, like open educational resources (OER). We’ve been helping foundations and governments adopt open policies and exploring new ways of licensing scientific data. Teachers and learners everywhere — from Kenya to Canada — are reaping rewards of shared information and knowledge, with huge savings. All of that work, old and new, is supported by a small team, and a lot of inspired supporters and volunteer advocates, including more than 100 affiliate teams in 75 countries. Our licenses have become the global standard for legal sharing, and they underpin many of the most well-known media platforms on the web. If Creative Commons plays a role in how you use the internet or share your work, please consider making a gift to support the organization. Our licenses are (and will remain) free, so developing a stable funding stream to support sharing has always been a challenge. A generous — but small — group of individual donors has always supported us. Let’s grow that number and work together to build a better internet and world. As you’re considering which charities to support this year, please take a moment to reflect on what we’ve built together these past 12 years, and the challenges we face in copyright reform, open access, and building an open web for everyone to learn and create. In a world of worthy causes, it’s our job to demonstrate the value of CC to individuals, governments, institutions, and corporations. And especially to you. Please support us and help us spread the word. PS: In a few weeks, we’ll be releasing information about the state of the commons — our most accurate assessment to date. Watch for it.